I should confess that I have been putting a gap between north jazz and me since a long time, but especially after listenning albums of Lars Danielsson and plus Julian & Roman Wasserfuhr brothers, I changed my mind and I have been following especially the catalogue of ACT Music. So, one of them is Nils Landgren and he is the subject of this review with his album " The Moon The Stars And You". I listened some sound clips of this album and decided to buy its vinyl. Before the album, I'd like to mention to Nils Landgren. He is a really succesful trombonist in jazz area and especially his funk albums in ACT Music catalogue but the one that I interested is this album where he is also in vocals. Since the beginning, I've been liked jazz standards especially the ones in slow tempo and this album The Moon The Stars And You is a work just like that. Landgren collects sentimental jazz standards in this album and all of which I like so much. Additionally, he putted Cat Stevens's Moonshadow as the first track in side A. If you take a look to the album, the general concept is the songs whose main subject is the Moon, so we can call this album as a sentimental album from the point of this concept. Generally, I like jazz music which makes me relax while listenning and not makes me to thing what the composer tries to explain in the track. In this album, I can find easily what I look for. Let me explain briefly; suppose that you back to your home after a tough day, so just put this album on to your turntable and take your wine or cofee , close your eyes and just listen. Album will take your all stress and fatigue. 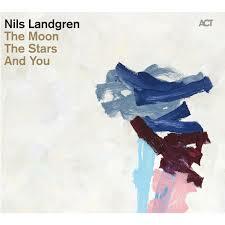 If we talk about performance in the album, I can say that Nils Landgren also is a good jazz vocalists as an addition to his talent in playing trombone. Besides, a strong band works with him such as Lars Danielsson , also guest musicians are very impressive such as Joe Sample or Steve Gadd. The band and the guest musicians and also NDR Bigband &;Stockholm Philharmonic Orchestra play with a great harmony in the album. A last words for recording and mixing, both are great. Finally, if you are a jazz lover you should get this album, I prefered to buy its vinyl as I believe that the real sound is in vinly but also CD format of the album is available.